It’s Been a While, or Did I Lose Myself? When I started up this blog, I promised myself that I would not begin it and then let it go, that I would keep it up regularly. So, less than one month in and I took a couple weeks off. Not a good track record. I have been struggling physically and emotionally for the past couple of weeks and I think it was probably better for me to post nothing than to post what was really going on. But enough bad thoughts. On with the good. K, the 16 year old, is getting ready to take the ACT this weekend and we have a college visit set up for next week. The journey of parenting this child has been a bumpy road, full of sudden and jarring highs and lows and unexpected twists and turns. The last two weeks have felt like 6 years. But I know that if I just ride it out, this child will end up being a good man. He has it in him – I see glimpses of it. There is so much potential in that kid. But the road, my friends, the road has been rough. I pray for the road to become straight and smooth for at least me. I need some straight and smooth road. Last night, whilst backing the car from the garage, I took out the driver’s side mirror on the garage door frame. I had a few choice words when I did that. I texted the husband what I had done. His response? “Well now it matches the other side!” I took that one out last year and with no job, I have no money to pay for new mirrors. They still work, just with very cracked cases. Maybe I should look at a smaller car which could be fit into the garage with greater ease? My creative outlets have taken a back seat during this blog respite as well. I have done very little in the way of knitting, crocheting, spinning, or drawing. It is this which has me pretty convinced that I did lose myself into a mini depression. There are a couple of crafting retreats/fairs that I would like to go to in the next couple of months, but with no money coming in they are out of the question. And is it fair for me to ask for a weekend to get away from it all when I spend most of my days at home alone anyway? I know that is affecting my mental state – my opportunity to get out and spend time with like minded friends doing crafty things has been taken away. Frustrating. Enough whining. Today’s Objet d’Art is String 008 from tanglepatterns.com. Link: http://tanglepatterns.com/2012/07/tanglepatterns-string-008.html I feel like this is around the time when my drawing really started coming together and the freedom of the ink was flowing through me. P.S. The lava lamp died shortly after I wrote about it. Sad. Am I an Idiot? Or Not? Debatable. Yesterday was a holiday for the kids and the husband. Me being unemployed – every day is a holiday. So that leaves Tuesday feeling like Monday. Everyone is back to school/work (except for A1 who is ‘ill’ and sleeping). I have to log in to the school’s website to find the phone number for their attendance line. Recently, they updated the site and I cannot find a phone number for the school anywhere. Last week when A2 was ill (notice the lack of quotes), I ended up emailing the school nurse because I had her email address. So when I finally found a main phone number, I got the secretary on the phone and expressed my hatred of the new site. So she quickly and easily pointed out to me where the phone number is. Hmmm… now I feel like an idiot. Having two teenage kids and one tween, our house is an revolving door of silence and drama. The son is a junior and we are working on ACT prep and looking at colleges and discussing potential careers and majors. By ‘we are working on’, I mean that his father and I talk, he grunts and leaves and then his father and I fight. Talking to the son, I am asking the right questions and feel good about our communication process. Talking to the husband, I am doing the wrong things and not looking at the situation correctly. ??? It is so frustrating. I need to take lessons in mediation to get through this process. And to think I get to do this two more times. I have a phone interview this afternoon for a job that I think could have great potential. There are things about it that make me more than a little uncertain. As the husband says, there is nothing to decide until there is an offer on the table. Good statement. I will just look at it as good interview practice. What really cracks me up is the recruiters. I have several recruiters working on my behalf and this is the third to want to go through a plan with me for how to do a phone interview. Like telling me to have a copy of my resume in front of me. Now I feel smarter than them. Not an idiot. It is a daily struggle being the wife and mother. At this point though, I am not getting through things one day at a time, it is one hour at a time. I’m going to have to do some drawing or knitting or something today that will calm me. And watch some bad TV. Bad daytime TV always makes me realize how sane and normal I really am! Todays drawing is tanglepatterns.com String 007; link – http://tanglepatterns.com/2012/06/tanglepatterns-string-007.html This is one of my favorites from my sketchbook. I hope you like it too! Also, I have added a link icon to tanglepatterns.com at the bottom of the blog. Try it. I promise it’s easier than you think. Silence is golden. Especially in a house with children. When the kids were little, if it was too quiet it was usually because they were up to no good. But now, on a Saturday morning they are all sleeping in. The husband went in to work this morning to get some things done without everyone else around and he is the one who usually gets everyone up and going. Me? I let them sleep and enjoy the peace and quiet. Out the window that faces the woods, I am watching squirrels that are the same color as the bark of the trees. They are going up and down and in and out of holes. Sometimes, two or three of them get in some kind of tussle. It is fun and sometimes funny to watch. I have even caught the cats sitting quietly in the back yard watching them. Probably hoping for some kind of meal. I hope they don’t catch one, because they would probably leave a disembodied head on the front stoop as a gift for me. I really enjoy their gifts of love. Ew. Today I have some plans, but nothing serious or definite. The only thing on my schedule that is absolute is watching the Iowa State-Kansas basketball game tonight. We have heard there are a few pro-Iowa bars here in Kansas City and may try to go to one of them to watch the game. It should be a really good matchup. The last few games have been rough and I don’t think this will be any different. On the blog roll today, I am hoping to add a sub-page to the Fiber Gallery that will document the progression of a particular fiber I am spinning. My work on it has been fairly detailed and I think it deserves a page of its own with a photo progression – so watch for that. Today’s photo of Zenspiration is tanglepatterns.com String 005; link http://tanglepatterns.com/2012/06/tanglepatterns-string-005.html and a bonus of String 116 which I used some new oil pastels to work on; link http://tanglepatterns.com/2014/08/tanglepatterns-string-116.html . I am trying to show Alyssa some tips and tricks on using color in non-representational ways since she believes she can’t draw. Final thought for the day: Enjoy the silence! The last few days have been rough at home. I had sick kids, lots of cleaning to do, and a routine dental cleaning that sent me into a full fibro-flare. For those of you unfamiliar, a flare is horrible. For me, it is pain in every cell of my body. And it won’t go away until it wants to. Thankfully, this one was able to be knocked out with a combination of some prescription medication and lots of sleep. It has left me with a seriously hungover feeling for a couple of days. But today, I woke up with some energy and it feels like my brain may be back. Woo Hoo!! This is so comfortable and the pattern is true genius. I can see making many more of these as gifts and having them go over gloriously! Today’s drawing of the day is String 004 from tanglepatterns.com . I like this one relatively well. It is one where I learned that it is okay to go outside of the lines of the string, but I think I just put too much in there. And it is a little off balance. Lessons that have to be learned, right? And here is the link to today’s string: http://tanglepatterns.com/2012/06/tanglepatterns-string-004.html I hope some of you who have never tried to draw do try this! It is so meditative and much easier than you think! Thanks for reading and clicking on those links. There are some fabulous people behind them. Have a great weekend and as always, please let me know what you think! I really want to hear what you have to say. I am faced with a dilemma every single day. As a person who is unemployed and used to working a 40 hour a week job, I have found this enforced 4 month ‘vacation’ very liberating as an artist and crafter. While it has been good for my health, it has also been a very prolific time for me to practice a variety of art and craft forms. At this crossroads, I find myself wishing that there could be some way for me to earn money as an artist/crafter. But it is not just that I want to earn some money, I want to earn enough money. Enough money to satisfy the lifestyle to which we, as a family, have become accustomed. Enough money to pay off student loans. Enough money to put into retirement plans and college savings plans for the kids. Enough money to keep the electricity on. Is this possible? I know there are people that do it, but I cannot work like the people I know that do it. I cannot spend 12 hours a day on my feet. I cannot travel extensively and do trade shows. And I certainly can’t hire help to do that for me. Would I have to concentrate on one particular medium – fiber, spinning, drawing, painting? Would having a person selling a crazy combination of everything confuse people? I don’t know. This is part of the conundrum which paralyzes me as an artist. Paralyzes me. My craft suffers for me overthinking my motivations. And if I did try to do art/craft for a living, would it become work and not a passion? On the other hand, I was contacted by yet another recruiter trying to get me to apply for a job at a specific company. This is probably the 7th person I have had contact me regarding this company. At first the choice was easy because the position was one for which I was overqualified and would be underpaid. Now, there is a senior level position which would be appropriately compensated and when the position converted to full time the benefits would be spectacular. However, there would be no flexibility and the commute would be long. I will apply and if asked I will interview. I feel like I have to for my family. My crossroads. It is very difficult to be here, looking at the signs. I know where I want to go, but it is different from where I should go. The last few days have been difficult. My fibromyalgia is acting up – hip and upper leg pain has prevented me from participating in many activities. It seems like when I get in bed at night, it is the worst and I toss and turn to find any place comfortable enough to sleep. The new Fitbit I got for Christmas records my sleep patterns. When I set it on the normal setting, it shows my sleep is very, very restless. Out of 8 hours in bed, my non-restless sleep is less than 3 hours. Ouch. This is, I am certain, a large contributor to my high levels of pain. I have been working on knitting a cowl/poncho in a really lovely blue/purple yarn that was chosen by the husband. I was hoping to have it done last night and be able to post a picture today, but that didn’t happen. I will probably finish it today. With any luck, I will have enough yarn left to make myself some matching fingerless mitts. My spinning wheel has been gathering dust. I don’t think I have spun more than one time since Thanksgiving. It is a hobby that brings me true joy and I really do need to dedicate some time to it daily. Another thing I need to dedicate time to is finding a job. I kept telling myself that I would find something and the job search would pick up after the first of the year. Nothing much has happened. To be honest with you and myself, this is a little depressing. Do I need to change what I am looking for? Is my expected rate of pay too high? Am I less talented than I think I am or do I come across as offensive in interviews? I just don’t know. I am at some kind of crossroads and it is painful to me. I know I need to make some kind of decisions, but I am paralyzed by all of the choices. Today is full of random happenings. Just full of them. First of all, it is really cold. I don’t much care for cold. But the sun is shining and the sky is blue. It looks like it should be a beautiful summer day if you look out the windows. Except that there are no leaves on any of the trees. So I have a fire going in the fireplace. I got the wood to burn today – I figured out which wood in the pile wasn’t burning from yesterday. I am doing a couple of crafty things. I had to frog back a cowl that I messed up in the focal point of the whole thing, so I had to go back past that point. I just finished getting the needles back in, but I seem to have lost my motivation to pick it up again. I am also trying to teach myself to crochet. Last weekend a book on Granny Squares jumped into my cart at Michael’s. Not sure how that happened. AND then I started a 12 inch square canvas drawing. We’ll see how it turns out. I’m not really sure about the size, but I’ll keep going. An email came today that is screaming in my psyche. The first ever Interweave Fiber Fest is happening about 5 miles from where my parents live. I wonder if I can convince the high school junior that he needs to check out the local university and we could go that weekend? Spinning, knitting, weaving… other people with the same passions and a chance to see my parents? Sounds perfect to me! Lastly, I am starting a new diet. My scale put me at a really frightening number and the fibromyalgia thing makes consistent exercise difficult. A friend tipped me off to a diet that others like me have had really good luck using. So that starts today. We’ll see how that goes. It’s expensive, but if it works that will be priceless. I’m not going to go into any details (oh, wait… I might), but 2014 was a long and stressful year for me. I have developed several crafting ‘talents’ to help me in coping with the stress and giving me an outlet for it. A couple of these, I have been doing for a while. Knitting and spinning (spinning yarn on a spinning wheel – God forbid I should exercise!) are crafts I have known and loved for a few years now. Learning to knit is just a slippery slope into spending all of your money on yarn and other fibery goodness. And you find you know more about sheep, goats, alpaca, bison, and musk ox than you ever wanted to know. It’s not good conversation starter. 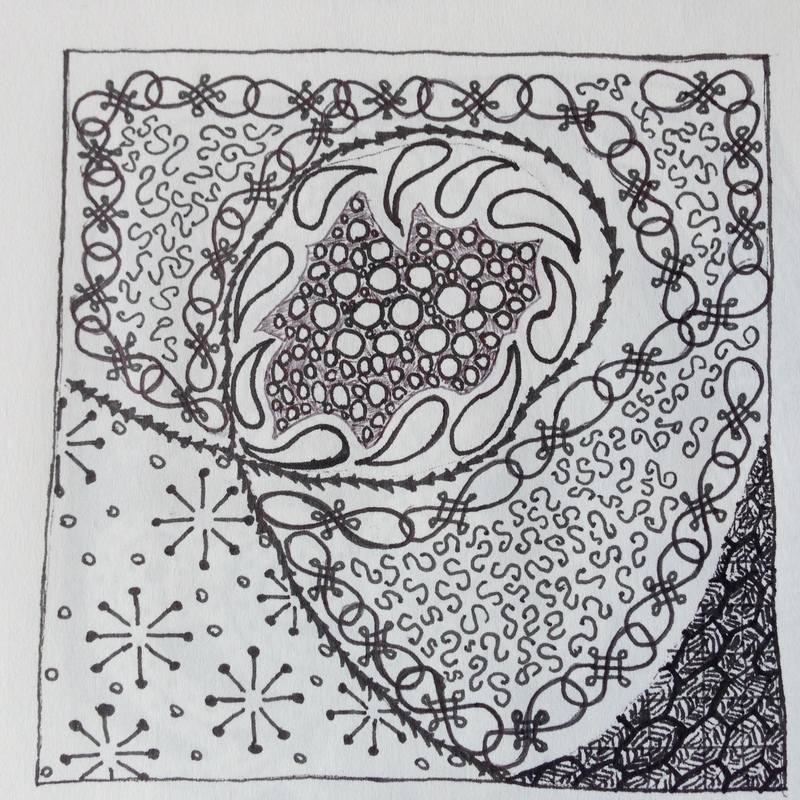 Then I found Zentangle®. (The Zentangle® art form and method was created by Rick Roberts and Maria Thomas and is copyrighted. Zentangle® is a registered trademark of Zentangle, Inc. 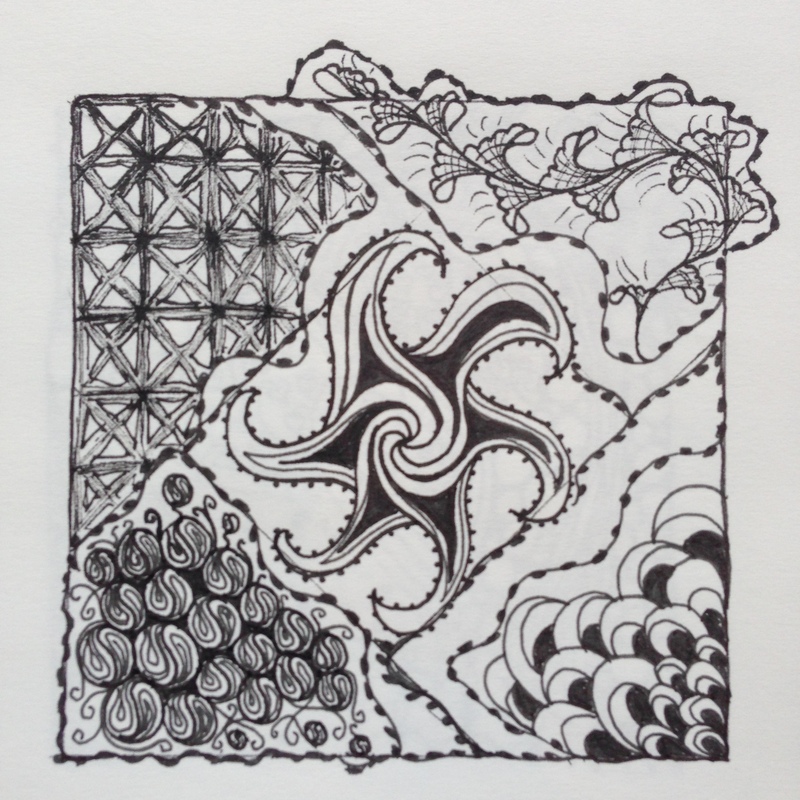 Learn more at zentangle.com.) Through the website TanglePatterns.com, I have become an addict to tangling and creating what is called ZIA, or Zentangle® Inspired Art. I have no thought at this time of becoming a CZT, or Certified Zentangle® Teacher, but I do admire their skill and what they do. I only hope that my little pieces of art enhance the art form in some way. When I found TanglePatterns.com, I bought a sketchbook and started tangling. I began by using the strings published on the site. I have now decided that my goal is to do at least one drawing for every published string. I have a long, long way to go, but I can certainly see my progression as I go. I have also begun doing drawings and tangles on canvas that can be purchased at the big box craft stores as well as pre-cut melamine letters. These are very fun and I enjoy them. I hope you will be patient with me as I get photos posted and write about other things. Like how some of the wood in my wood pile just won’t burn properly.